Nantucket decorating reflects the lifestyle and design style of the Massachusetts community of Nantucket Island. Nantucket, located about 30 miles off the coast of Cape Cod, is a popular tourist destination as well as a National Historic District. Founded in 1671, Nantucket has a long sea-faring history and was the world's whaling capital in the late 17th century. Today, the island is noted for its dramatic cliffs, picturesque harbors, and plentiful seafood. Nantucket is a simple, typically New England style, which draws its influence from the sea that surrounds the island and Nantucket's fishing and whaling history. 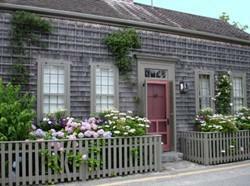 Nantucket decorating is simple, not elaborate, and includes many natural design elements, such as wood shake siding, slate, and cobblestones. Nantucket style design is a good choice for Northeastern and Midwestern homes. Colors - The predominant colors used in Nantucket decorating are those colors found in the sun, sky, and sea, such as blues, grays, greens, bright whites, and browns. Other colors found in the New England landscape, such as cranberry-bog red and navy blue are also commonly used. Natural Elements - One of the most noticeable aspects of Nantucket design is the use of natural wood shake as siding for homes and businesses. The wood may be either painted or left natural to age to a sort of silver gray color. Wooden wainscoting and shutters are also commonly used. Natural stone also plays a part in Nantucket design. Slate and stone fireplaces are commonly used as are cobblestone walkways and foundations. Fabrics and textiles also carry on the natural theme and often feature flower and nature prints or rough hewn fabrics. Furniture - Nantucket design incorporates simple painted wooden furniture and elegant antiques for a kind of old-money look. Distressed finishes, such as pickled stains and worn edges give Nantucket furniture that timeless "country cottage" appeal. Accessories - Accessories, too, mirror Nantucket Island's close proximity to the sea and its simple, New England past. Nautical elements, such as ship's wheels, lighthouses, and fishing nets are often used as are faux windows and wooden blinds and shutters. Flowers are a common accessory, both bouquets of fresh flowers and preserved sprigs of dried flowers.